It’s no surprise the wheels are coming off in Syria, and in the absence of an agreement between the various parties regarding Syria at the upcoming Munich Security Conference, things are certain to deteriorate further and at an increased pace. Therefore, the pressure is on all sides to arrive at a solution to prevent further bloodshed among the civilian population in Syria and to prevent an escalation between the various military groups operating in the region. There was at one time, a completely plausible plan for the region that has gone off the rails — not because any side opposed it — but because there was no oversight to bring the plan to fruition. In between President Obama’s ‘Pivot to Asia’, the Arab Spring, and the U.S. elections that brought Donald Trump to the White House, the Syrian situation was left unguided and (no surprise!) it therefore deteriorated. Major powers are now bombing each other’s troops and shooting down each other’s aircraft (and who knows what else is going on that isn’t reported) which makes escalation a foregone conclusion in the absence of leadership and implementation of the original plan. Prior to the Syrian conflict the plan for the region was to bring Iranian #2 (sweet) crude oil and Iraqi #3 (semi-sweet) crude oil via a proposed pipeline across the northern part of those countries and across very northern Syria to the Mediterranean for export to Europe, Turkey, and Israel. Not only would Iranian and Iraqi crude oil be transported by the proposed pipeline, pumping stations along the route would allow Syrian #3 (semi-sweet) crude to be carried by the new pipeline. Iran’s #2 sweet is highly prized by refineries around the world because it requires much less refining than sour crude oil and it allows a relaxed maintenance schedule for refineries so they can operate continuously for many years before requiring a mandatory and hugely expensive maintenance protocol. For example, Iran’s #2 sweet oil can be used to blend very sour oil (such as Canadian tar sands oil which is rated at #4.75 sour) to bring it up to a standard where it is acceptable to an oil refinery. Further on the Canadian example which is very roughly comparable to the problem facing other refineries around the world, Canadian refineries presently purchase huge volumes of Saudi #3 semi-sweet in order to blend with Canada’s toxic #4.75 oil — but access to Iranian sweet would allow Canadian companies to meet refinery standards with much less foreign oil. In rough terms, a certain refinery in eastern Canada receives one Saudi supertanker per week to blend with Canadian tar sands oil — otherwise the refinery would never agree to process that sour Canadian oil — but if they switched up from Saudi #3 semi-sweet to Iranian #2 sweet it would allow that same refinery to purchase only one supertanker per month to blend with the sour Canadian oil. It would be a win for Canadian oil producers, a win for the refinery, and a win for consumers as purchasing fewer (expensive) foreign tanker loads leads to lower prices at the gas pump. The situation is only slightly different in the United States. Texas still has a small production of #3 sweet crude, while Pennsylvania (where the modern oil business began) has none left whatsoever. Refineries in Texas have for decades gladly accepted #3 Saudi semi-sweet to blend with their #4 sour so they can blend it to meet their target of #3.25 semi-sweet before it hits the refinery — thereby saving the refinery millions of maintenance dollars per year and saving American consumers money at the gas pump. Even refineries in Europe and Russia benefit from blending sweet or semi-sweet with their oil allowing them to bring their most sour crude to a standard that is acceptable to refineries. Otherwise, all that sour crude would be left in the ground forever. Prior to the Arab Spring, few had heard of the Kurds other than seeing 30-second video clips of their troops helping coalition forces during the Iraq War, and even fewer knew about ISIS. Buoyed by their participation with the Americans during the Iraq War, the Kurds were also recipients of generous non-American foreign aid. The Kurds (who have some negative ‘history’ with Turkey) decided the proposed pipeline route should be ‘protected’ by their troops as the security situation in northern Iraq was then at an all-time low. It’s completely logical from their perspective to want to secure those areas and make them part of their traditional Kurdish territory, and this was seen as a ‘minor good’ by Washington and its allies. No doubt the Kurds would have been recipients of even more foreign aid, many pipeline jobs, and they would have been in charge of security along the part of the proposed pipeline corridor that would run through their territory. ISIS saw the opportunity to steal the default option from the Kurds and fired the first shot. Hence we now have Americans fighting ISIS and sometimes using the Kurds to do it. We have Turkey and the Kurds fighting each other. We have the Russians helping Syria. And we have various other countries supporting those or other groups operating in the region. Finally, we have the long-term and largely stalemated situation that exists between Israel and Syria. A recipe for disaster, if ever there were one. Instead of a Munich Security Conference that degenerates into shouting match, all sides should return to the forgotten plan and concentrate on making that plan the new reality. Bringing Iranian sweet crude oil, Iraqi semi-sweet crude oil and Syrian semi-sweet to the Mediterranean via a new pipeline system through traditional and newly created Kurdish territories across northern Iraq and very northern Syria while continuing to finish off ISIS and working to mitigate Turkish concerns about the Kurds is the only real way forward. 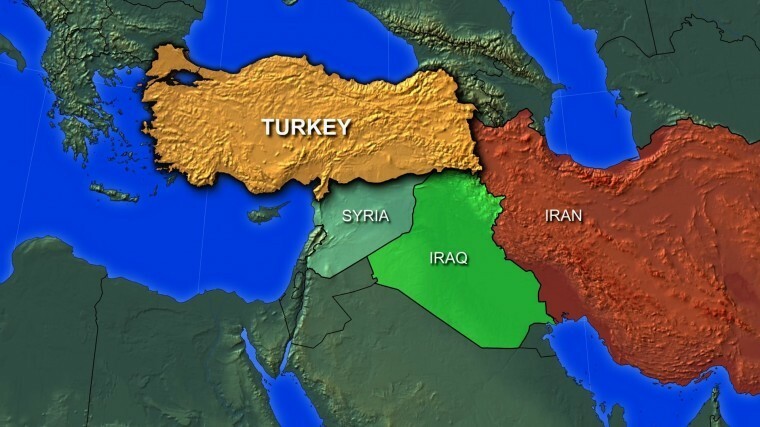 Internationally recognized Kurdish territories span northern Iraq and northern Syria which could allow a direct Iran, Iraq, Syrian oil pipeline to the Mediterranean to bring high quality Iranian #2 sweet crude oil to Europe, Turkey, Israel and even to North America. Image courtesy of Iran Review. Whether the parties agree to redirect their energies now, or at a later date, it’s the only option that solves everyone’s problems in the region. The plan depends on the extinction of ISIS and that seems as worthy a goal as ever while accommodating the Kurds is simply an extension of what’s already been happening. Solving the security concerns of Turkey is paramount to bring the plan forward. The world needs that high quality oil and it’s in the interest of the parties to get that pipeline system built and operational as soon as possible. The UK government can play as honorable a part as any country to bring this ongoing political disaster to a successful conclusion by promoting the Iran / northern Iraq / northern Syria pipeline that would span old and newly created Kurdish territory to bring exceptionally high quality oil to Europe, Turkey, Israel and even North America. It’s time to stop looking at the problem and begin working on the solution. By Letter to Britain in European Union, Iran, UK on February 16, 2018 . Peter Zeihan (“The Absent Superpower”) pointed out that Trinidad and Tobago is one of the few places that can refine Venezuelan crude. The current government of Venezuela loathes the Americans. But would they be willing to do business with Commonwealth members such Trinidad and Tobago and the UK? As a result of your comment, I’ve done some preliminary research and it looks like Trinidad and Tobago are poised for an economic mini-boom as gas and oil prices rise, upon which their GDP depends heavily (47% of national revenue comes from the petroleum sector) so it would be brilliant if UK companies and individual investors were to take an interest in T&T. Looks to be a stable country that is about to ‘come into its own’ — and good for them!